Is Instapage your landing page builder of choice? It’s a great tool, but it’s not going to help you build smarter campaigns. That’s where Kickofflabs comes in. KickoffLabs AnyForm for Instapage is a script you can copy & paste onto any Instapage landing page to unlock features that will help you do better marketing. Our unique referral generation system makes any campaign 35% more effective. Take engaged leads and turn them into advocates with an immediate call to action that encourages sharing. We generate unique social referral tracking links on thank you screens & automatic emails. All you need to do is provide a little incentive. Custom fields can be used to store additional contact information such as a subscriber’s address, city, country, or phone number. They’re also great for collecting unique information about subscribers to help you provide more relevant and personalized content. Build your custom form in Instapage and KickoffLabs AnyForm widget will automatically capture any custom form fields. Post-conversion “Thank You” pages present a valuable opportunity for driving leads to take further action. Now you can chain your Instapage landing page to it’s own, dedicated, thank you page to deliver digital bribes & incentives, offer referral sharing based rewards, or to increase your campaigns virality. Offer tiered rewards to people that share with friends. Build a waitlist that lets people cut in line by inviting friends. Create a leaderboard which helps drive competition for generating leads. And more! Email new leads a thank you message with built-in lead magnet distribution. Share their referral progress and motivate leads to share more. Reward leads for reaching sharing goals. Give away digital downloads as bribes. Push all your lead information into popular bulk email services like MailChimp, AWeber, Drip and others. 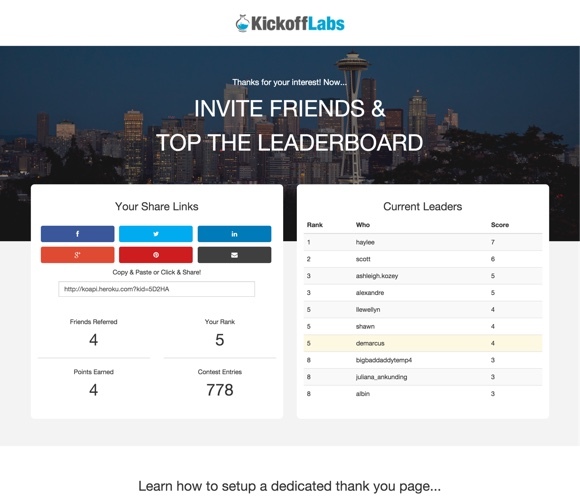 KickoffLabs is the perfect platform for incentivizing people to signup with rewards. Unfortunately, the better the rewards, the more likely it is that people will try and fraudulently increase their referral scores by gaming the system. We provide you with the latest in email security to both help mitigate fraud and improve the quality of your leads. Force leads to verify their email, exclude bad IP’s, and flag potential fake emails. Kickofflabs Reports go beyond conversion rate to teach you more about your leads than you thought possible. You’ll be able to build better customer personas, write better copy, and improve your marketing. Measure your success over time. View demographic, social & campaign data. Track virality and identify influential leads. The insights you need to make smarter decisions. Don’t let a visitor abandon your site without getting something in return. KickoffLabs Bounce enables you to popup an amazing offer before someone forgets about you forever. KickoffLabs Bounce can give your conversion rate an increased boost – with no additional code! What are you waiting for? Turn your current Instapages into a viral engine! Using another landing page builder? Accelerate your growth by connecting to KickoffLabs.